Like many of Rome’s earliest Christian churches, the Santi Cosma e Damiano Church (or Basilica dei Santi Cosma e Damiano) was once a pagan temple and incorporates elements of its original Roman architecture. After becoming a church in 527, however, the interior was richly decorated with mosaics considered to be masterpieces of sixth and seventh-century art. This circular church and adjacent monastery are located at the original entrance of the Roman Forum, in what was once the Foro di Vespasiano, and are home to some of Italy's most important early Christian mosaics. 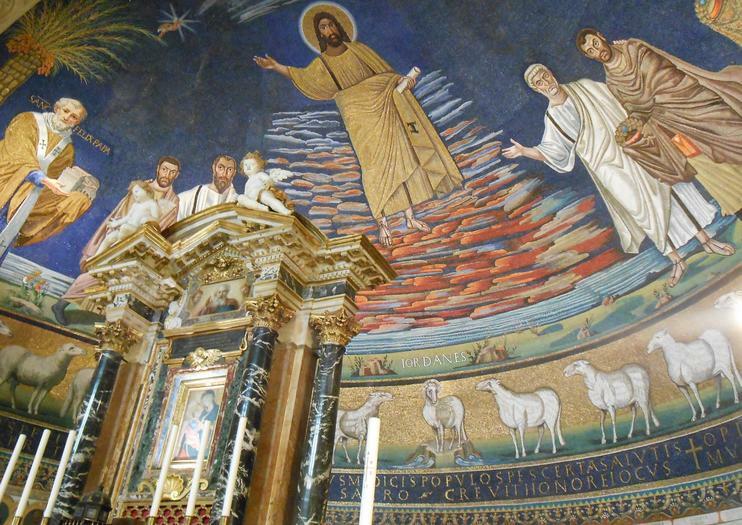 Many private tours of the Roman Forum include a stop in the basilica, and devotees of Saint Damian can also join a day excursion from Rome to Assisi and Orvieto to visit the Chiesa di San Damiano as part of a tour of Assisi with a private guide. Though the church is part of the Forum complex, the entrance is through the monastery outside the Forum, so you do not need tickets to enter. Visitors must wear clothing that covers shoulders and knees to enter the church. The church and cloister are accessible to wheelchairs; the crypt beneath the church is not. Photography (without flash) is allowed inside the church. The basilica is part of the Roman Forum (Foro Romano) complex, located on Via dei Fori Imperiali near the Colosseum. Take metro line B to the Colosseo stop. The Roman Forum is usually busy, but this separate area is less visited, meaning you don’t have to expect crowds throughout the day. September 26 is the saint's day dedicated to the church’s saints, Cosmas and Damiano. This makes for a particularly beautiful day to visit the church during the celebratory mass. The basilica is dedicated to the saints Cosmas and Damian, two Syrian brothers who were physicians and, after martyrdom, became the patron saints of doctors and veterinarians. The church was first a fourth-century temple dedicated to Romolo (or Romulus, the deified son of Emperor Maxentius) before becoming the Church of the Saints Cosmas and Damian in 527. Free and Fast Track entry to the Colosseum, Vatican Museums, Sistine Chapel and St Peter’s Basilica. 2 great passes rolled into one: The Roma Pass allows free entry to 2 out of 5 top attractions plus discounts at 30 further top sights and a travel card. The Omnia Vatican Card allows entry to all top sights in Vatican City plus a 3 day hop on hop off bus tour. See the sights of Rome and Vatican City at your own pace with the Rome Card and the Omnia Vatican Card, two sightseeing passes that offer full and discounted admission to some of the city’s top attractions. With the Rome Card, choose entry to two out of five attractions such as the Colosseum, enjoy a hop-on hop-off tour and take advantage of a Rome travelcard for public transport. Use the Omnia Card for skip-the-line admission to the Vatican Museums, Sistine Chapel and St Peter’s Basilica. Visit the sacred city of Assisi and the medieval hill town of Orvieto on this full-day private tour from Rome. Learn about the birth of the Franciscan movement as you explore the relics of UNESCO-listed Assisi. After lunch (own expense), continue to charming Orvieto to admire the magnificent Cathedral of Orvieto and hear stories of religious legends, Saints and miracles as you explore its hallowed halls. This is an independent tour starting from Rome to discover the land of St Francis and St Clare of Assisi. During these 3 days a private guide will help you to discover the architectural and spiritual beauty of Assisi, which is a medieval hill town in central Italy’s Umbria region.